Ugly formula horror trying very hard to seem deeper than it is. ...A low-rent, awkwardly metaphysical Alien, with psychics. The isolated Tolmekus Research Institute satellite is conducting psychic experiments. Things bode ill when a passing ghost ship presents Moira--one of those being studied--with an image of terrible slaughter. The terror soon spreads to the satellite, as a creature capable of projecting terrifying--and fatal--images into the minds of its victims begins to pick the residents off one by one. Roots Search is the story of a psychic research facility that becomes a stopover point for a spaceship full of dead people. Of course there was a nasty thing on the ship that killed everybody, and now it's going to hunt down the few people on the space station. Alien rip-off? No, much worse. The basic Alien massacre thing is here, and the psychological horror aspect is cranked most of the way up, but when it boils down to it Roots Search keeps implying that there is something deep or mysterious going on. In the end, it all adds up to absolutely nothing but a vague and entirely unsatisfying anti-climax. I can't think of many things more annoying than a cheesy horror movie desperately trying to be deep. Oh, and it's pretty ugly, too (with a few surprising moments of visual coolness). While this isn't the worst anime I've seen, it's down there: Unattractive, formulaic, yet confusingly pseudo-deep. Might be worthwhile for heckling, or if you're really into vaguely metaphysical sci-fi horror, otherwise a confusing waste of time. One of US Manga Corps' earliest releases, and forgotten in nearly every country. 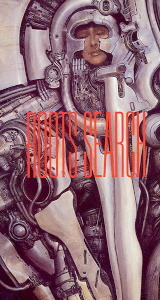 The VHS box art for the US release is taken from the Japanese LP cover. Yes, it's so old there were actually records of the soundtrack. Was available in the US from US Manga Corps on subtitled VHS and LaserDisc, both long out of print (and their license has expired). As of 2010 has never been released on DVD in any country. Roots Search is Copyright © 1986 Nippon Columbia Co., Ltd. Any images are the property of their respective rightsholders, and included for review purposes only under the fair-use clause of US copyright law.